Junk and Rubbish Removal Services in Georgia. At 1844-Junk-Rat – junk and rubbish removal in Georgia is made easy… because we do all of the work! Finding a junk removal company that has a respect for nature and that is affordable isn’t always easy in Georgia. 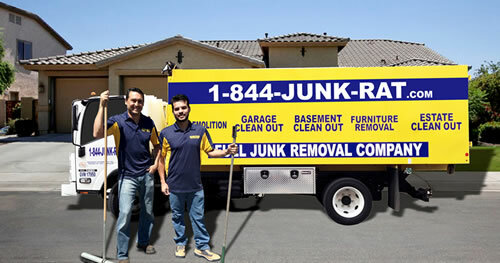 Thankfully 1844-Junk-Rat.com is here to provide affordable junk removal services that don’t harm the environment. To get a quote, all you have to do is speak with one of our courteous staff members and explain your junk removal project. We remove all manner of items such as debris from construction project, old furniture, yard clean up trash and even large appliances. We make sure to call you when we are on our way to your location and are dedicated to always arriving on time. Our 1844-Junk-Rat.com junk removal agents will arrive in clearly labeled truck and present you with your agreed upon quote before starting any work to avoid post haul confusion. We take care of all the heavy lifting mo matter where your junk is stored so you can rest easy on the sidelines while we help you reclaim your space. In fact we are similar to a disposal bin or dumpster in terms of what we can take as disposal – however we offer you much more value! – We are definitely less expensive and more convenient than renting a dumpster since you don’t have to pay for dumpster pick up and drop off fees, no cost of disposal and the inconvenience of having to do all lifting and loading yourself. Nonetheless to say, we don’t have any hidden fees and we do ALL the lifting. Not sure what I can say to express my happiness regarding 1-844-JUNK-RAT.com residential junk removal services. I called another company that had low rates only to be left waiting in vain for some one to show up to help with my residential junk removal project. After that disappointment I called 1-844-JUNK-RAT.com and they were able to have someone come out the next day. Not only were they on time, but they were courteous enough to call when they were on their way. Their rates are pretty affordable, even if you are on a tight budget. When they came out, they jumped right into the work and efficiently completed it in much less time than I anticipated. The best recommendation I can offer is that I plan to call them again in a few days after I sort though more junk and need to have it hauled away. Did I mention that they recycle? Yeah, it’s a good thing considering the amount of waste in the landfills these days. Visit our pricing page for details . Top rated affordable professional junk removal and cleaning for your residence or business in !